Hard Rock Cafe needs no introduction thanks to their fantastic blend of a legendary dining experience and rock music. They've decided to shake things up and add the fun of American Rock-n-Roll with the infamous German Oktoberfest and thus we have Rocktober Fest. 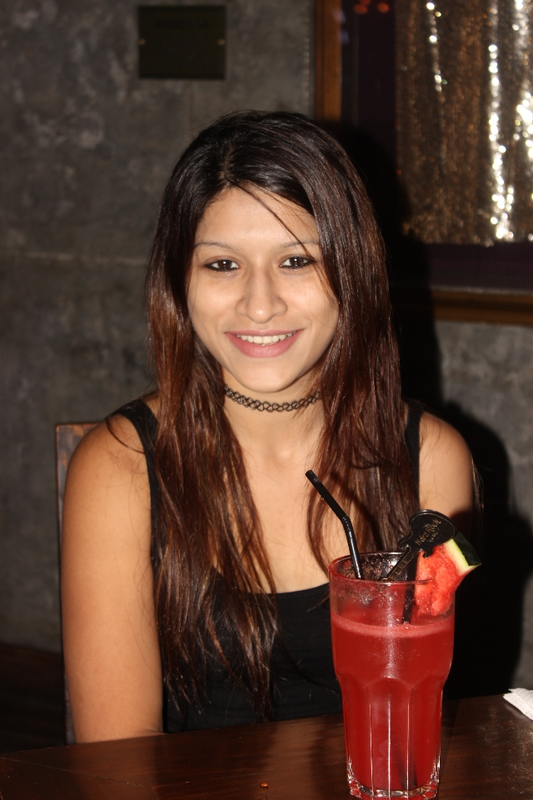 Its basically an entire month full of high octane music, a special lip-smacking menu, a variety of international beers, Shandy, beer cocktails and entertainment in the house only at your favourite Hard Rock Cafe. If you follow me on instagram, you probably know that I eat and drink way more than a fashion blogger should! Then I remind myself that I need to stop eating so much and lay off food reviews. However, its Rocktober so here goes! Hard Rock Cafe has an amazing array of Octoberfest specials and I decided to start with the Watermelon Vodka Hoedown, a delicious and refreshing blend of vodka, watermelon juice, lemonade and beer. I love all the ingredients which went into it, so a mix of all of them just made things better for me! Note the tattoo necklace from my previous post! 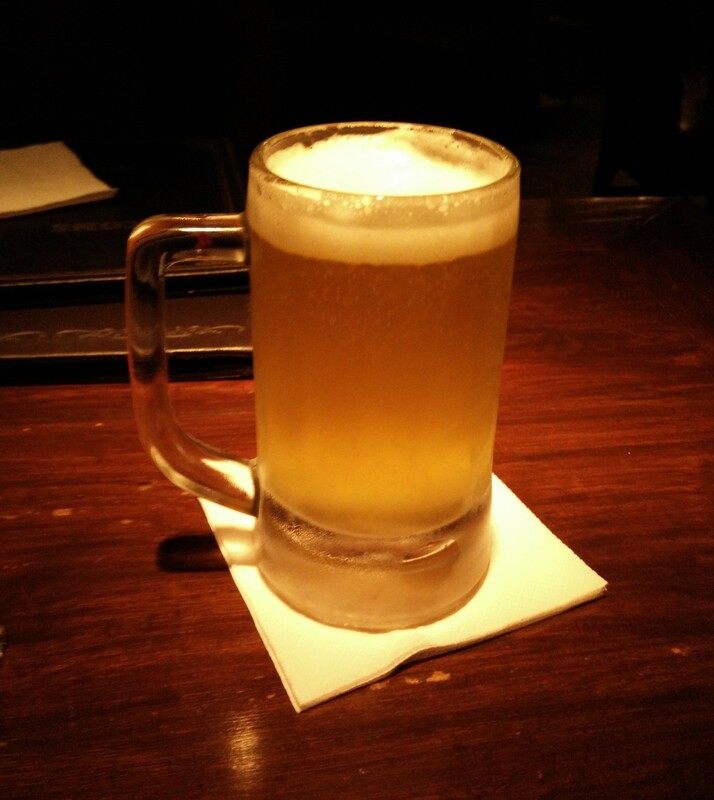 Octoberfest is incomplete without beer so of course we ordered one too! What's the perfect snack with beer? Fries of course. 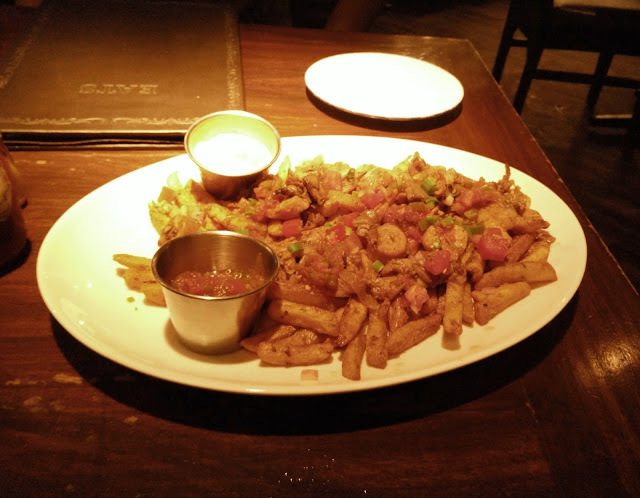 And as a part of the special Rocktoberfest menu, they have the Carnival Fiesta Fries which consists of spicy chili garlic fries topped with bbq spice rubbed chicken and smoked chicken frank slices. Yup, fries with chicken! Served with a tangy salsa and a very yummy cheddar cheese sauce. I was on hungry monster mode at this point of time so I didn't bother to take a good picture because all I wanted was fries!! The special food menu for the festival has a variety of hamburgers (Thai, Jamaican) and hot dogs (Asian, Italian, American, and German) but I skipped them because I'm not much of a bread eater. 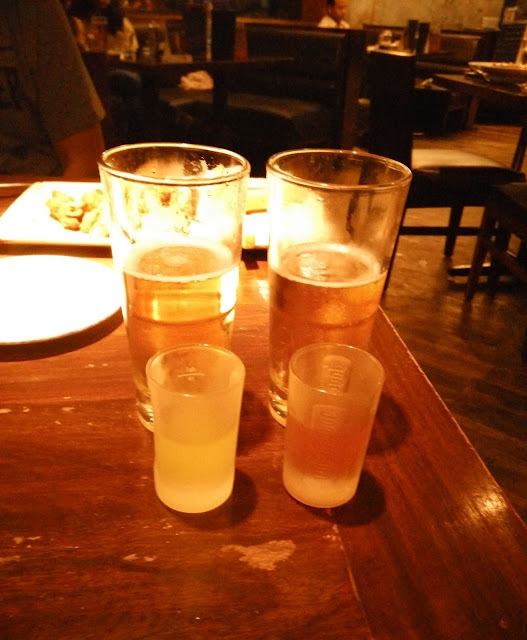 I was recommended to try their special shots for Rocktoberfest and so I gave it a shot (haha) They have the tangy orange bomb (a blend of Bacardi orange, orange liqueur, lime juice) and the Carlton's (a blend of dark rum and orange liqueur) Both need to be chased with a glass of beer the same way we have a jagerbomb. We didn't like the tangy orange bomb as it tasted kinda medicinal, however, if you love rum and are in the mood for some shots, Carlton's is a good choice! I have a weakness of wings so we went for the dry seasoned Rockin Wings which are marinated with their signature smoked dry rub, slow roasted and served with blue cheese and carrots. These are nice and spicy and oh so good. If you ever go to Hard Rock Cafe anywhere in the world, don't miss these! Impressed with the Watermelon Vodka Hoedown, I then tried the Pomegranate Vodka Shandy which is a mix of Vodka, Pomegranate, Lemonade and Beer. I liked this one even more than the previous because it was really tangy and lemony and super delicious! 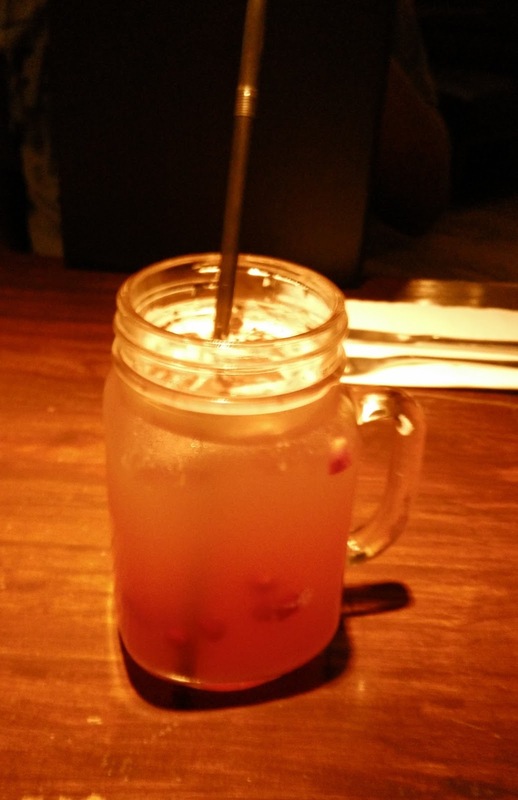 Oh, and it was served in a cute mason jar mug! 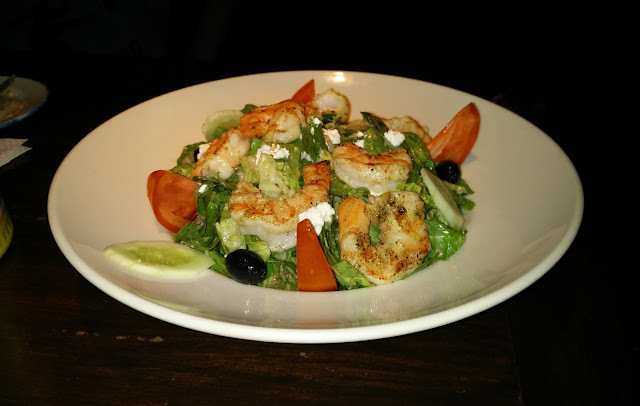 Though I'm a total carnivore, I have a special place in my heart for Greek salad. I went for it with a topping of grilled shrimp. Their version has a lot of greens with the usual blend of tomatoes, cucumber, onion, red pepper, feta and black olives. I prefer a much tangier version with no greens, so this one was a bit mild for me. However, the prawns where heavenly and the quantity was really generous. 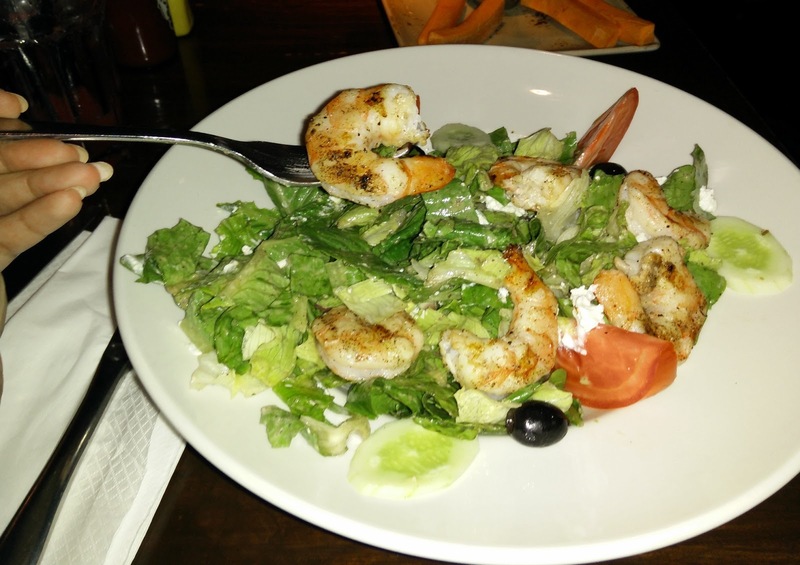 Make sure you add grilled prawns to your dishes at Hard Rock Cafe because they are out of the world! Being the alcoholic I am, I wan't quite done drinking and then went for the Raz Rita which is a mix of sauza gold tequila, triple sec, raspberry syrup and fresh squeezed margarita mix. This was my favorite of the lot! Its just so good. If you love raspberries, you must have this one! 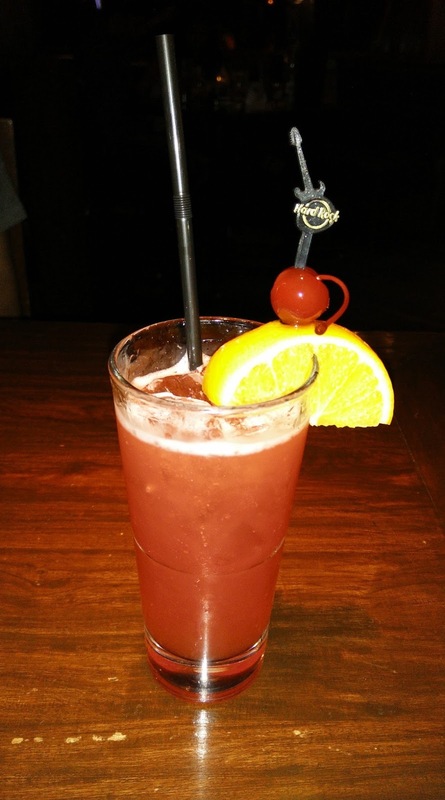 We also had the Bahama Mama, a blend of rum and coconut rum with banana syrup, grenadine, pineapple and orange juice. Bae liked it but I don't like the taste of banana syrup so I stuck to my Raz Rita. After killing it with the starters and salad, we finally ended our night at Hard Rock Cafe with the Mediterranean pasta with grilled shrimp. 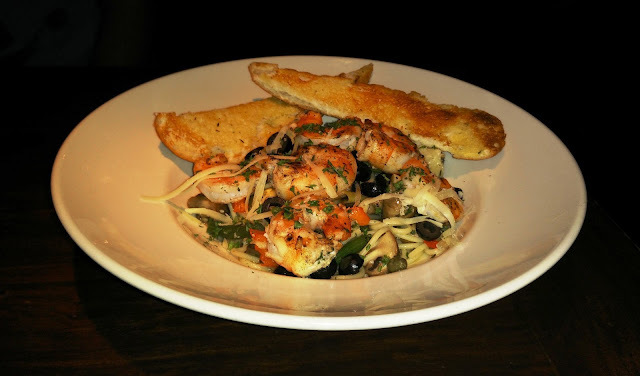 This one comes with fresh green beans, artichoke hearts, oven roasted mushrooms and capers in a light garlic sauce garnished with roasted red peppers, black olives and parsley. I loved how light and healthy it is! Try it out if you're sick and tired of creamy or tomato based pastas. 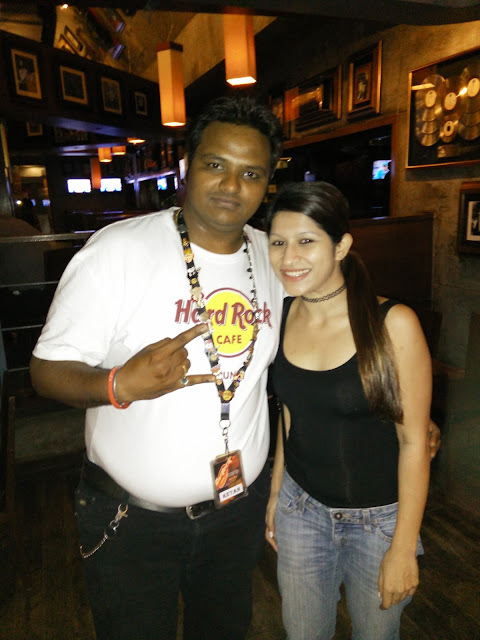 Here's me with Ketan, who made sure we had a fantastic time at Rocktober fest at Hard Rock Cafe! Rocktober Fest is on till the 8th of November, so you have exactly a month to enjoy the festivities! Don't miss it! I loved the name! Roctober! I love fries and watermelon, plus pomegranate, but I confess that I don't drink much alcohol - but I would gladly have the watermelon drink with fries! It all looked so delicious! I apologize, I have to send you the interview questions,l but I am so busy this week! But I will send soon! Aw that's place is super cool! Awesome, thanks for sharing June! Looks like they have a great mix of food and drinks! Roctober sounds awesome! The Hard Rock Cafe in our city has disappeared many years ago, but I remember that the food was delicious, I miss it! Mmm... your photos make me hungry :-D! I'm glad you had a great night there! What a great place, the food looks good! The food looks amazing...it's making me hungry now! Not your typical Octoberfest food, but I guess the name counts. Roctober....I like the sound of that! So many yummy dishes...and those drinks look awesome! Lovely place and the food looks great! This looks so fun! It’s been too many years since I’ve been to the hard rock café. Lovely picture of you also. I am also guilty of being a total foodie! And that food looks so goooood! Heyyyyy June!! I'm also doing Octoberfest tonight!! :D Looks like you had a ball babe! !